I couldn’t agree more. 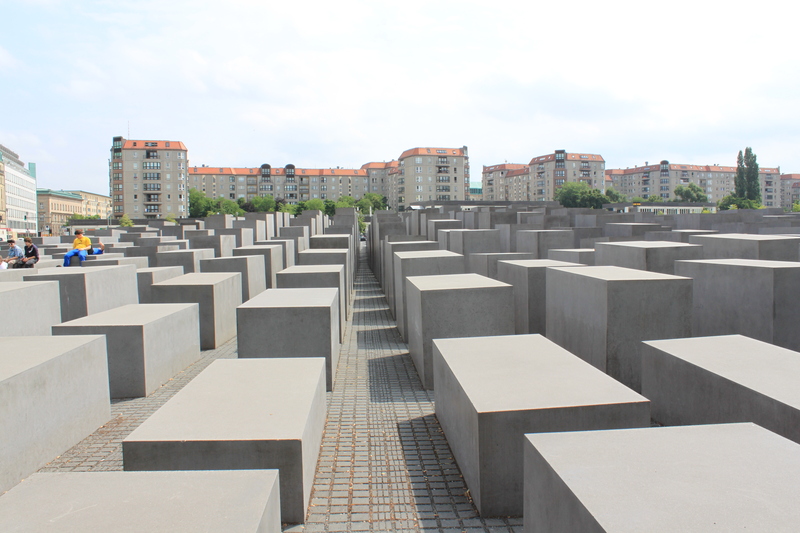 For today’s photo I decided to show a picture of the Memorial to the Murdered Jews of Europe, located in Berlin, Germany. This memorial is Germany’s national holocaust memorial. The grey steles vary in size and they represent the six million people killed by the Nazis in concentration camps between the years 1933 and 1945. Peter Eisenman, the architect, wanted to create a confusing atmosphere. At first glance it looks ordered, but upon further inspection the order doesn’t make sense. This entry was posted in Travel Photos and tagged 50 Year Project, Berlin, Blog, Blogging, Concentration Camps, Germany, Holocaust, Jewish Memorials, Life, Memorial to the Murdered Jews of Europe, Memorials, Nazis, Peter Eisenman, Photography, Travel, Travel Blog, Travel Journal, Travel Photo, War, World War II. Bookmark the permalink. An incredible monument to the holocaust – very grim when inside – especially at night! I didn’t get a chance to go in. Will have to next time. It does make sense, even if it isn’t meant to make sense. It seems fitting for this horrible event in history. Very stark and unsettling, it must have been interesting to see in person. It was interesting to see. Such a simple way to demonstrate the confusion of the time and yet beautiful in a intimidating way. You’re right about the confusing atmosphere. I felt very… strange, for lack of a better word, when I visited. It’s hard to describe the emotions when standing there. Strange is a good one. I’ve heard that if you walk through it, it makes you feel sick. The floor is angled and the way the blocks are oriented make you feel like you’ve lost your way and don’t know where anything is anymore. I walked through it some, but didn’t feel ill. It is unsettling and confusing. And it makes a point–there was no point. Useless death and destruction. It’s an important place to visit. So many emotions when I stood there thinking of the history. That’s an amazing memorial. I had no idea until I saw your post. Thanks for sharing and thanks for the like of my post “Snowy Seating”. It is something to see. And your photo was lovely. Have a wonderful day! It just makes me feel sad looking at this. Saw this before in December last year TBM in the pouring rain ..bleak..grey ..very moving indeed. Sounds like the weather matched the mood of the memorial. So many lives lost. It is hard to fathom. That’s a very interesting configuration – an orderly disorder. Thank you for sharing this. Have you been to the Jewish Museum in Berlin? If not, you should definitely go next time you’re there. The main exhibition part is extremely interesting, but before you get there, you go through a sort of tunnel and there are three areas to that first part of the museum. All three are incredibly moving and very shocking, I had very physical reactions to each. One is just an empty cement room, dark grey, open windows very, very high up, like being at the bottom of a well. And the part that symbolizes exile is a little bit like this memorial – it’s an outside area and there are these square pillars, but they are much, much higher than these, two, three, four meters. On the top, trees grow out of them. The really confusing part is that the floor is slanted and the pillars are slanted in different angles – there’s no right angle anywhere. If you walk around for a few minutes, you start feeling seasick and confused and disoriented. Very powerful stuff. I need to check it out. thanks! I remember visiting this memorial last year, it was raining and amongst the tall concrete blocks you really felt disconnected with the rest of the city (and the world!). Eerie stuff. It is an eerie place. I wish I saw it when it was raining to add that extra bit.